On a crisp November morning, Katherine Hinn’s fourth-grade science class at TOPS K-8 School in Seattle is alive with the thrum of energy created by 28 wriggly 9- and 10-year-olds. But Bri Larson, a visiting instructor from the Beecher’s Pure Food Kids Foundation, cuts through the chaos like a seasoned pro. It’s a good thing, because Larson’s agenda for this workshop is ambitious: In the next two and a half hours, she will teach kids to become “food detectives,” meaning they will gain expertise in decoding food labels, understanding product marketing and discerning the difference between processed foods and whole foods. And they’ll put that knowledge into action by preparing a simple meal: chili. First up is learning about labels. Kids study laminated cards showing the labels of popular cereals, snack foods and energy drinks. Larson teaches the group to be wary of false health claims on packaging (Whole grains! Made with real fruit!). They compare the recommended daily amount of sugar (no more than 30 grams) to how much the average American eats per day (186 grams!). Nutritionists argue that the rise of diet-related disease goes hand in hand with our culture’s rising consumption of processed foods. At the same time, busy parents often find that they don’t have time to examine all the food their kids are eating, much less prepare homemade meals. 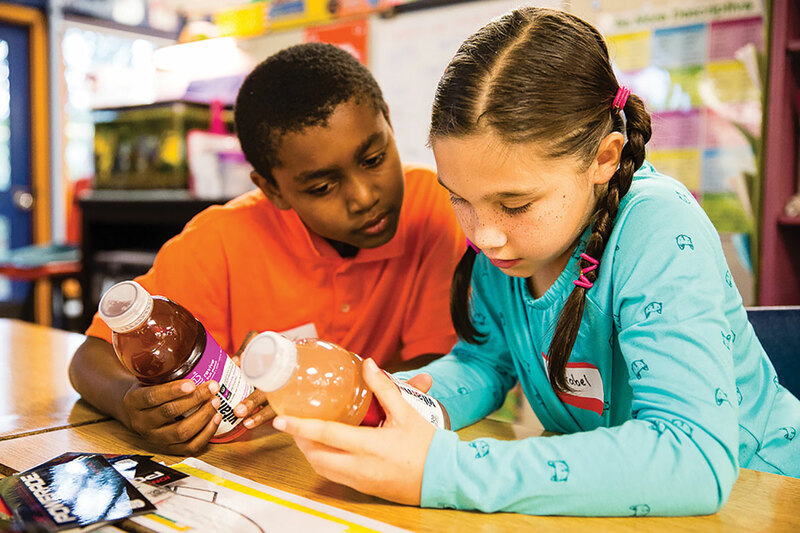 Hinn’s fourth-graders are just a few of the 20,000 Seattle-area kids who will become food detectives this school year, courtesy of this single, powerful workshop served up free of charge to local schools by Pure Food Kids. Kurt Dammeier, owner and founder of Sugar Mountain, the parent company of Beecher’s Handmade Cheese and other food businesses, started Pure Food Kids in 2004 with a simple but bold goal: Change the way America eats by empowering kids to make healthy food choices. Pure Food Kids executive director Kristin Hyde explains that Dammeier had originally planned to contribute 1 percent of Sugar Mountain sales to existing initiatives aimed at educating kids about nutrition. But when he looked around, he was unable to find organizations doing the work he envisioned, so he decided to create his own. Working closely with staff of Washington State University’s Food Sense program and other education experts at the state level, Dammeier and his team laid the groundwork for the initial workshops. They decided on a length of two and a half hours — short enough to fit into a school day, yet long enough to have an impact. The workshop would also be academically aligned with school curricula and standards. The foundation also launched a satellite program in New York City in 2014, running 58 workshops there in the 2014–15 school year, and is on track to reach more schools this school year. Turning the tide of diet-related disease? With child obesity on the rise, empowering kids to make better food choices isn’t just smart, it may be life-saving. The Centers for Disease Control and Prevention reports that more than one-third of American children are overweight or obese. Hyde says, “Many studies indicate that this is the first generation in modern history who may have a shorter lifespan than their parents.” Diet-related disease, she notes, has recently overtaken tobacco as the leading cause of death in America. It’s hard to believe that a one-time workshop can do anything to reverse these dire trends. But evidence suggests it has a lasting impact. In a quiz that Pure Food Kids instructors give at the end of each workshop, for example, participants’ knowledge of the topics increases by about 30–40 percent. And the learning seems to stick: Recently, Pure Food Kids had the opportunity to survey groups of local middle school students about their nutritional knowledge. Kids who had participated in a workshop a year or two before had clearly retained information, answering questions correctly about 70 percent of the time, compared to kids who hadn’t taken the workshop, who answered correctly about 40 percent of the time. Back in Hinn’s classroom, where the excitement is building as the kids start to cook together, it’s easy to see why. The cooking teams make a plan for dividing up the work and are given tools and ingredients. Kids vie for positions. One girl says to her group, “I chop onions all the time at home, so I should do it.” The boy next to her replies, “Well, I’ve never done it before and I want to try!” He is soon sawing happily away at the onions with the group’s green plastic knife while his “expert” partner peppers him with suggestions. Soon the kids will eat together, and — if the workshop hits its mark — go home armed with skills to do much more than make a mean pot of chili. Pure Food Kids workshops are free and offered to schools in the Seattle area, including private schools, public schools and homeschool groups. To organize a workshop for your child’s classroom, talk with the teacher about it and visit the Pure Food Kids Foundation website.